Exclusives have long been a thing that divides fans, and LEGO is addressing the issue. From a certain point of view. There was more nostalgia for Sunday's panels, which started with a look at Canadian collectibles and was followed by The Man Who Shot Luke Skywalker. Read on to find out what other panels took place and which Star Tots attendees received. Hasbro: The Vintage Collection Wave 6 Up For Pre-Order On Entertainment Earth! Coming in May, this assortment includes Elite Praetorian Guard, Imperial Stormtrooper, Captain Phasma, Lando Calrissian (Solo), and Chewbacca. Click here to secure yours! We love the latest addition to the Hot Toys section of our photo archive. Follow this link to have a closer look at The Last Jedi MMS459 Leia Organa 1/6 scale collectible figure! Next month's US brand store highlights are revealed in the latest calendar. 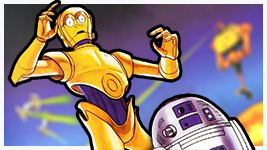 With the announcement of the classic Kenner inspired Retro Collection, our reprogrammed Imperial Probe Droid is tasked to weigh interest in the production of animated Holiday Special and Droids action figures. Follow this link to let your voice be heard! We've updated the Hot Toys section of our photo archive with The Last Jedi MMS458 Luke Skywalker (Deluxe Version) 1/6 scale collectible figure. Click the link above to have a closer look at this amazing addition to an incredible collection of figures! Details of the M4BWY activities in US brand stores have been shared. "Crush them! Make them suffer!" The Supreme Commander of the Separatist Droid Army is now available online in Canada!